The society has a range of documents on CD in its archives. Full details of this collection will be added here over a period. 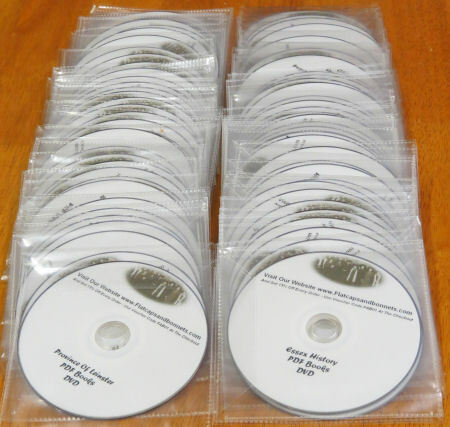 The Flat-caps and Bonnets CD collection of Historical and Genealogical PDFs that have been scanned from out of copyright original books and the actual scans/PDFs and database rights have been placed into the public domain by the institutions that have made them available. These PDFs are freely available to everyone who cares to search for them online, but have been conveniently assembled and catalogued, and placed on sale at www.flatcapsandbonnets.com. The full set of CDs hold something in the region of 8000 items, ranging from complete directories and history books through to small documents of a page or two. The Society is fortunate to have received from www.flatcapsandbonnets.com. a donation of a full set of all 78 CDs produced to date. Three of these CDs are specifically devoted to significant documents originated in Ireland. You can see further details of the Irish discs here and of the collection in general here.